For the first time in twenty years, three original members of the hard rock group Guns N’ Roses are back out on tour playing jam packed stadiums on four different continents. Rumors of a “Classic line-up” show have been spreading ever since lead guitarist Slash and bassist Duff McKagan left the band in 1993. The reasons for the break up are still unclear, but Axl’s arrogance, not showing up on time, refusing to be in the same room with other members and at one point calling Slash a “cancer” probably had something to do with it. “I think it’s pretty cool, I don’t really listen to them, but it’s pretty cool!” Said Brayden Forcien, a 9th grader at Perkiomen Valley High School, on the reunion of the group. In December of 2015, the official website of the band changed their logo back to the portrait of the dual revolvers and flowers around the sides. The last time this photo was seen in association with the group was on the back cover of the Use your Illusion albums, which were released simultaneously on September 17th, 1991. Fans began to suspect something was about to happen. Although Axl Rose released the 2008 album Chinese Democracy under the name Guns N’ Roses, he was the only original band member to be featured on any of the tracks, making this through back change worthwhile. “We need rock to come back, that would be a very anticipated concert.” Said Aaron Gruchevsky, a student a Perkiomen Valley. The news of the reunion was official when on January 4th, 2016, Guns N’ Roses was announced as the headlining act of the Coachella festival. Soon after, various shows were announced in major U.S. cities including: Detroit, San Francisco, New York, Philadelphia, and a surprise show at the Troubadour in their hometown of Los Angeles. 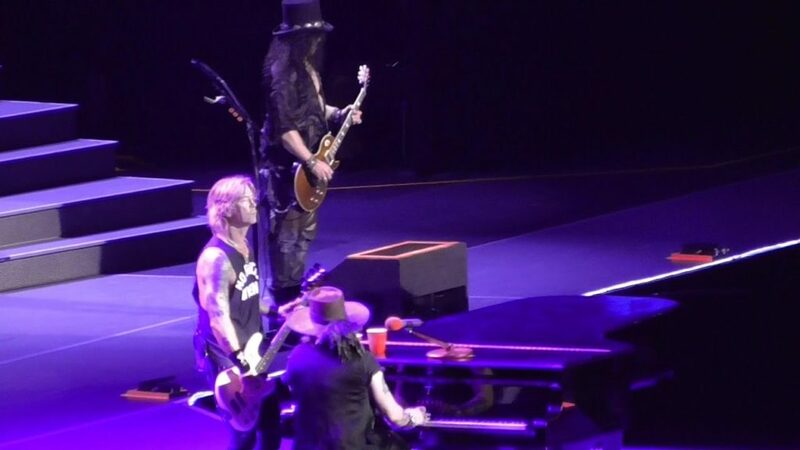 For most of their careers, G&R has opened with songs such as Welcome to the Jungle or Paradise City, both of which have moved down in the set for It’s So Easy, the second track on their 1987 album, Appetite for Destruction. The shows now widely consist of songs featured on Appetite and Use your Illusion I and II such as Knockin’ on Heaven’s Door,Sweet Child O’ Mine, November Rain, and Civil War. The band seems to occasionally throw in some of their acoustic songs from G&R Lies, such as Patience and Used to Lover her in the encore. “I saw Axl play with AC DC which was awesome, so yeah I’d like to see this.” Said Will Moser, a student at PV. As of now, the show has been performed in North America, Asia, Australia, and Oceania. The band will be playing nineteen shows in Europe and will be performing back in the United States, including Hershey Stadium on August 13th, and in Canada before finishing off in Rio de Janeiro, Brazil.